Holiday Goldfish Crackers x1000. | Dinosaur Dracula! 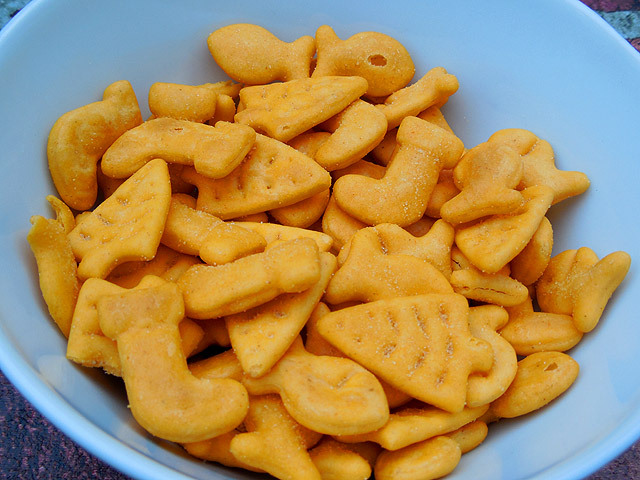 If “Christmas” and “Pepperidge Farm Goldfish” both rank high on the list of things you adore, you are so unbelievably covered. We’ve seen Christmassy Goldfish before, but never this many at the same time. 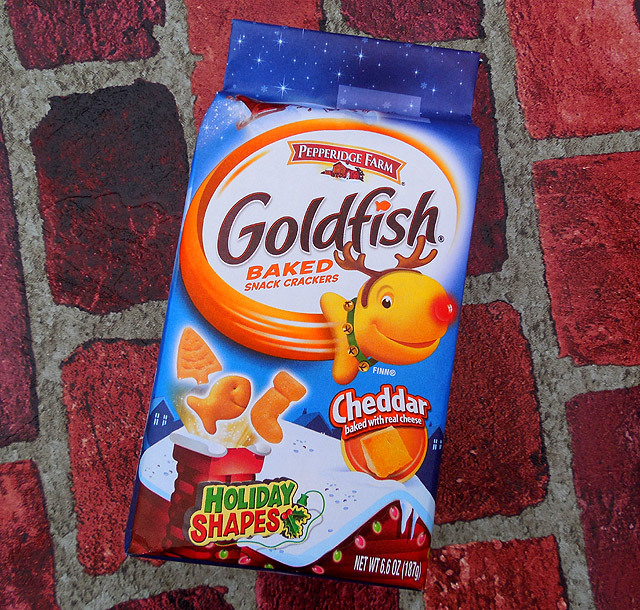 The only reasonable inference is that Pepperidge Farm Goldfish is the official snack of the holiday season. The volume is almost bizarre, especially when you consider that I found all three varieties at the same store, and that two of them are the exact same flavor. Since Pepperidge Farm is effectively competing against itself, we may surmise that the top of the mountain is a cold and lonely place. Normal people needn’t buy three bags of Goldfish, so I’ll do my best to help you make an educated decision. This process involves writing without much thought until each paragraph looks long enough. For instance, by the time I’m done with this sentence, this paragraph will. 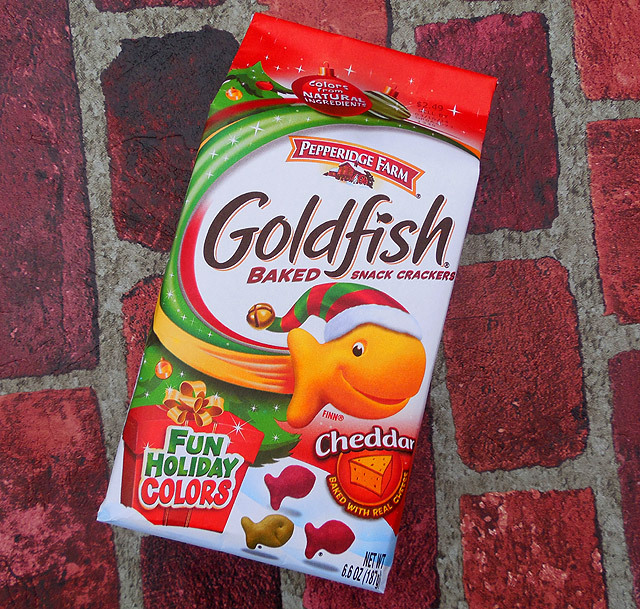 Cheddar Goldfish in FUN HOLIDAY COLORS! I’ve seen a number of people making quite a stir about these. Guys, where have you been? 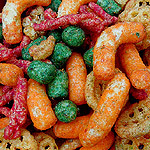 Red and green Goldfish crackers have been around for at least ten years! I can remember Christmases without them, but only in vague waves. I’ll be honest. 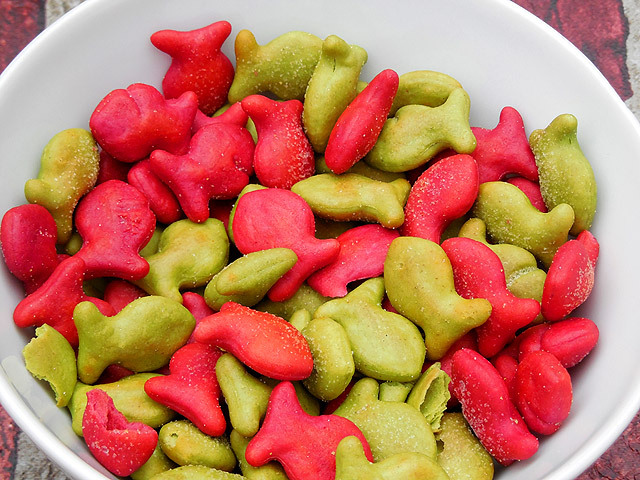 These are perfect if you’re throwing a party, or if you’re in one of those moods that can only be lifted by eating oddly-colored fish-shaped crackers, but I’d stop short of suggesting them for everyday use. They shouldn’t taste any different than “normal” Goldfish, but somehow, they do. The texture is slightly changed, and the taste is a wee bit off. 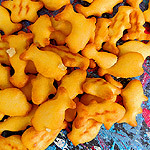 Since original Goldfish crackers are perfection personified, any deviation must mean imperfection. 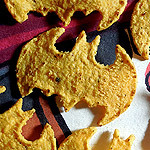 Cheddar Goldfish in HOLIDAY SHAPES! Wow, are these new? They may not be, but I’d never noticed them before. This time, it’s normally colored Goldfish in a variety of shapes, including the traditional fish, Christmas trees and Christmas stockings. The trees might be mistaken for arrowheads, while the stockings look like ten thousand different things. I see Gonzo noses and Super Mario pipes, and if I wasn’t so determined to keep Dino Drac clean and shiny, I’d see a couple of other things, too. Fools with diminished taste buds might have you believe that they taste just like the red and green ones, but trust me, they don’t. They taste better. Cheesier in a more honest way. I also love how the packaging revitalizes the old Goldfish mascot as a fish/reindeer Wuzzle, complete with Rudolph nose and an ethereal trail of cheddar space dust. Yes! 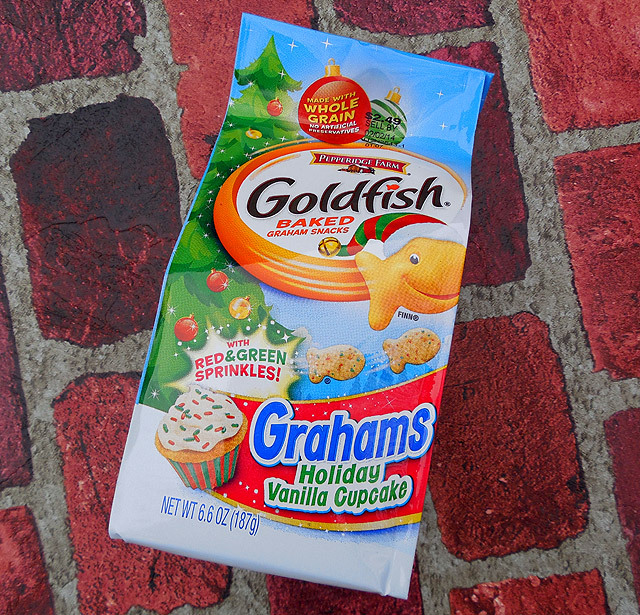 HOLIDAY VANILLA CUPCAKE Goldfish Grahams! 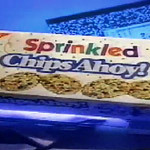 …with red and green sprinkles! I DON’T KNOW. 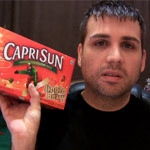 I was nineteen? I couldn’t pull off anything tribal? 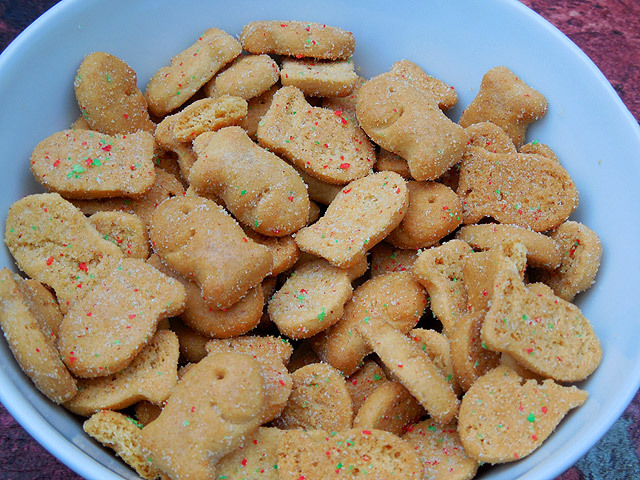 The cookies taste something like graham crackers and something like animal crackers. They’re right between the two. This kind of junk food isn’t my speed, but if you prefer sweet to salty, there are no finer fish. 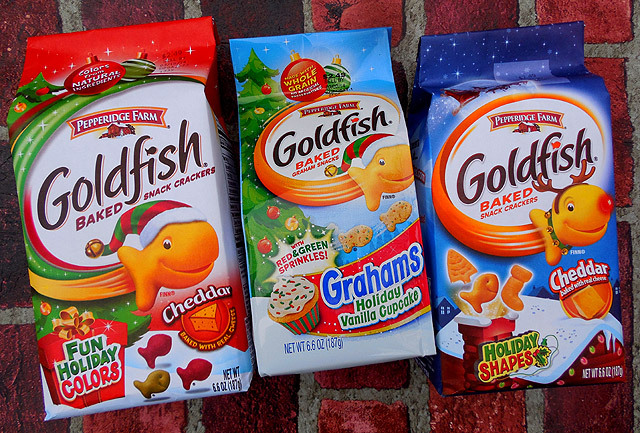 I wish you luck in deciding which type of Pepperidge Farm Goldfish is right for your holiday season. Oh, also, I’m on Instagram now. Follow me if you like photos of old soda cans with heavy filters applied. 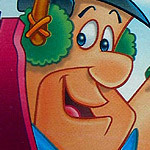 1998’s Bedrock Blizzard Pebbles Cereals!